Steel rod or even wire is a good alternative. It can be roller straightened and easily cut to size. Would look better on a 1/32nd scale model than it did on my 1/72nd Airco. 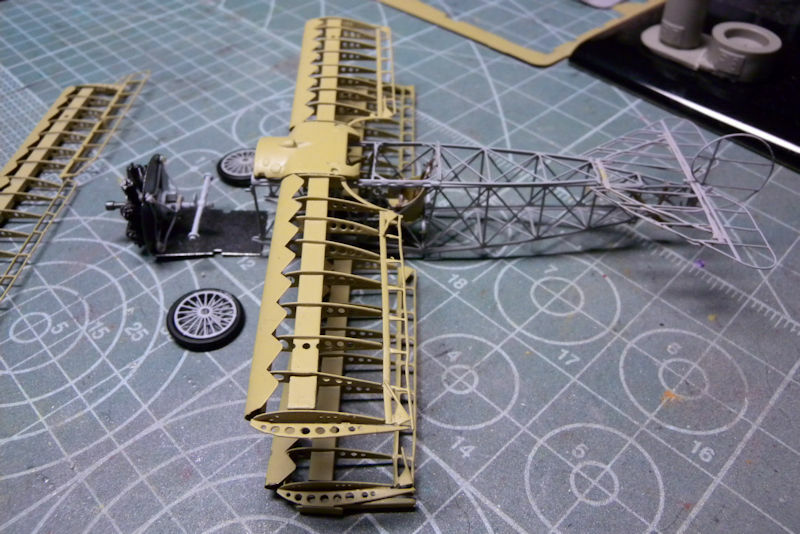 Wow nice work Mike, from here the rigging does not look out of scale. That sure is a ton of rigging to do. Thanks, Curt. I tried that method because there were so many. 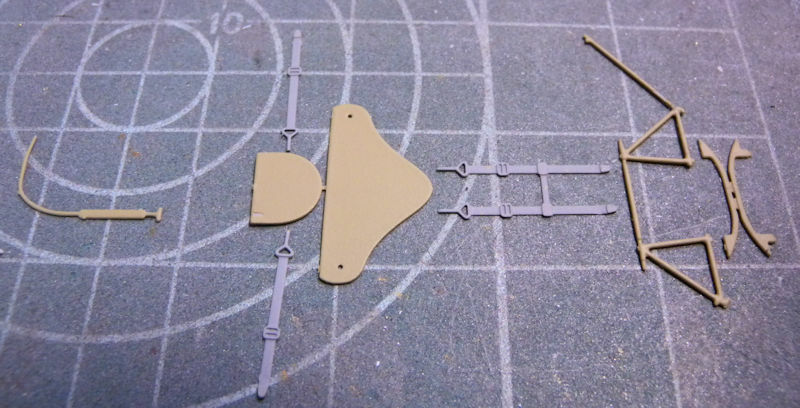 When I'd place EZLine on a spot, stretching later pieces would cause previous ones to sag. Well, I have some catching up to do. Al; nice to see you joining in. As is usual, you are doing some fine work. Mike and Paul; I feel your pain. 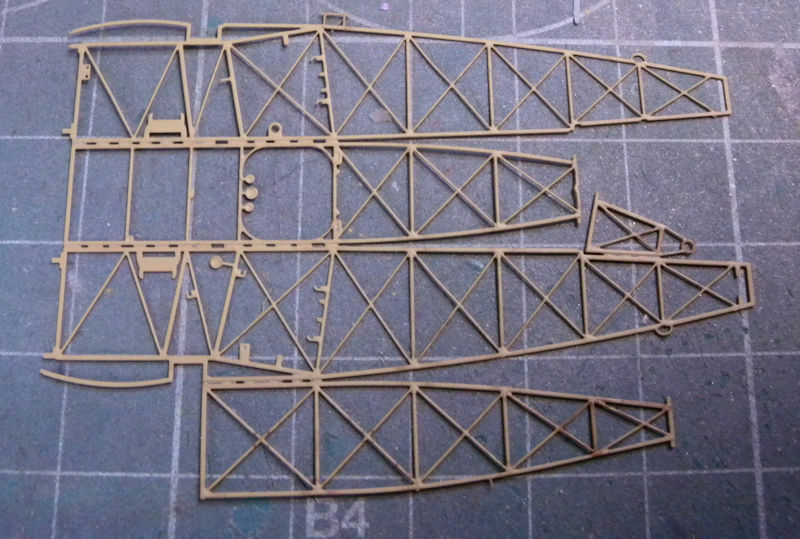 I have just gotten started on the upper wing frame. The photo etch is delicate to say the least. 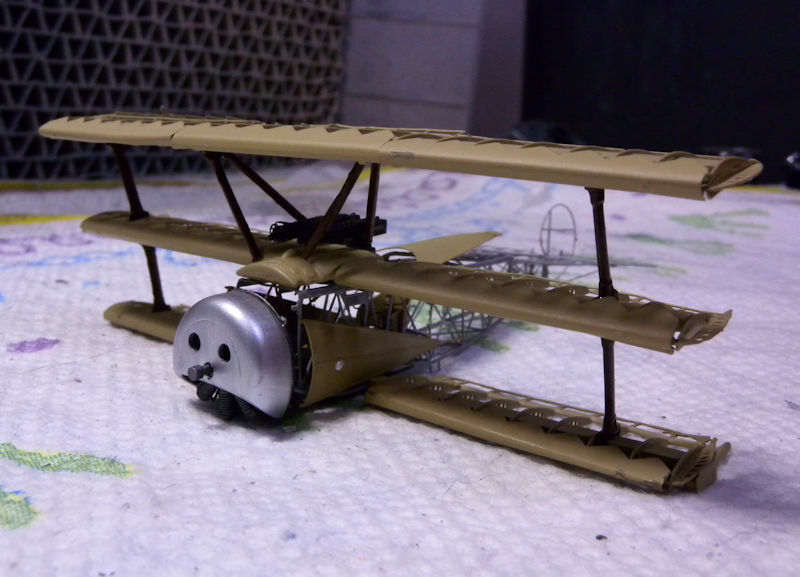 The center beam really does help to stabilize the frame. 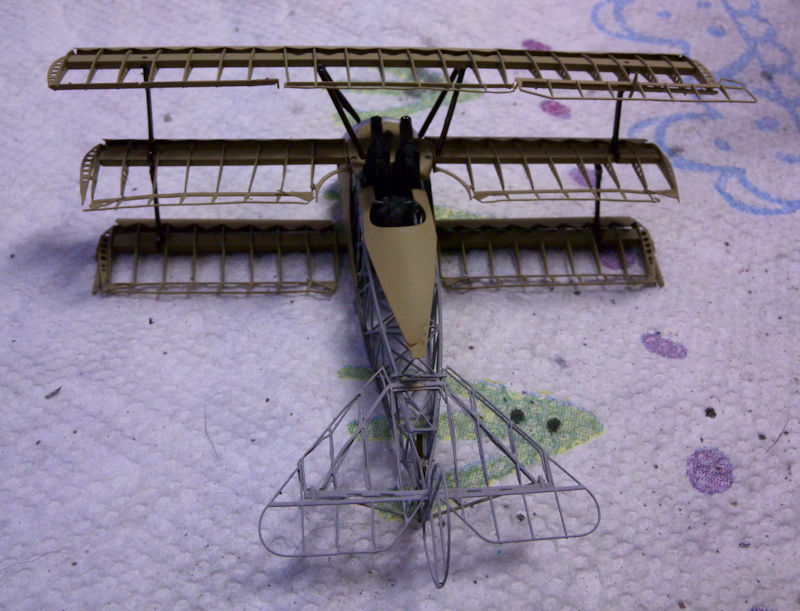 Now another test as I go about attaching the ailerons? 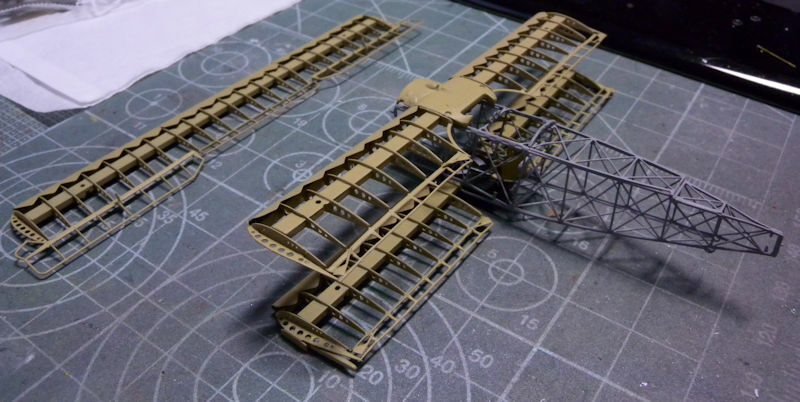 The upper wing is complete. Now to the center wing. The photo etch is holding up well considering all the bending of parts that takes place. One area of minor disappointment is the wing leading edge. 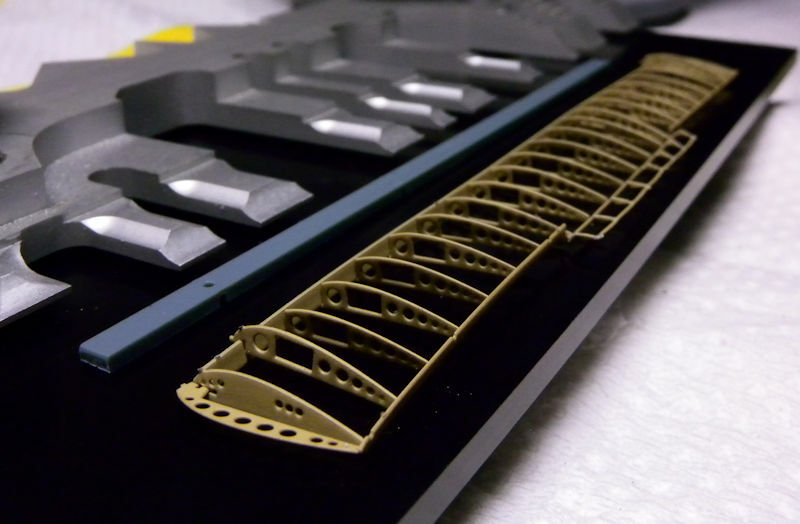 The resin forming jig did not produce the desired contour, or a consistent result. Well, I think I'll call this one complete. I won't put the flap controls on for fear I'll botch up the camo decals. So, here it is. Cole: That looks like a real test of patience you have on your hands. Nice work. Very beautiful. 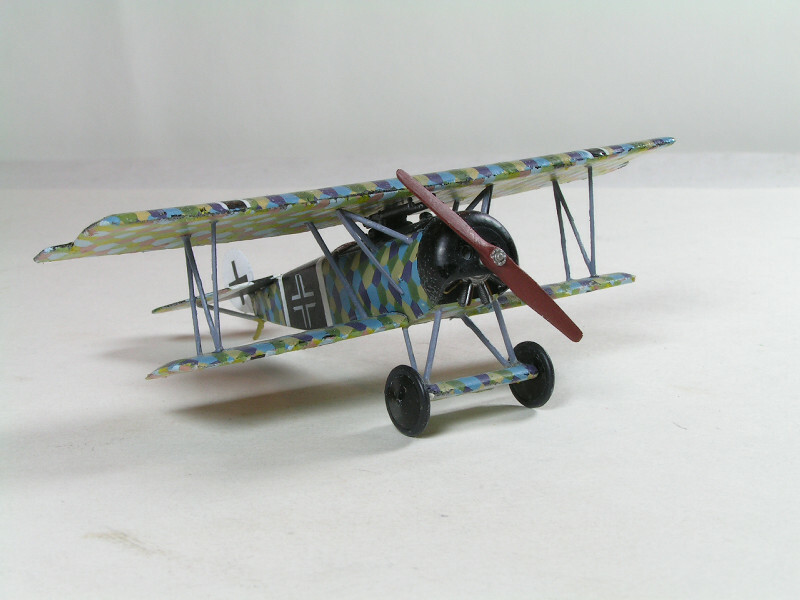 The camouflage patterning makes the flimsy plane look solid. Fine work, lovely addition to any collection! 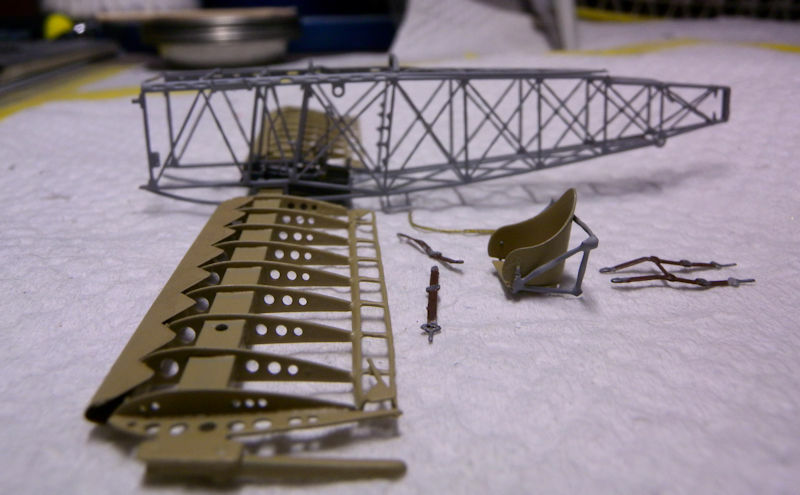 Bending the fuselage parts can be very tricky. What I used on a recent PART PE fuselage was a pair of kitchen knives. The top one at the bending line, holding the piece down and the other slid underneath. Then just twist the lower knife upright for a good straight bend. Thanks Mike. Years ago, I purchased a PE tool from The Small Shop. It has worked very well for me. This particular operation has been rather nerve wracking. But I am impressed at the engineering that went into designing this kit. After I figure out how to install the seat and harnesses into the cockpit I can breathe a sigh of relief. Wow! Slow and steady gets the job done, good so far! Finally some progress to report. The seat frame did not hold up to my heavy handed technique. So I had to improvise. The result is not as detailed as the original frame but it will suffice. 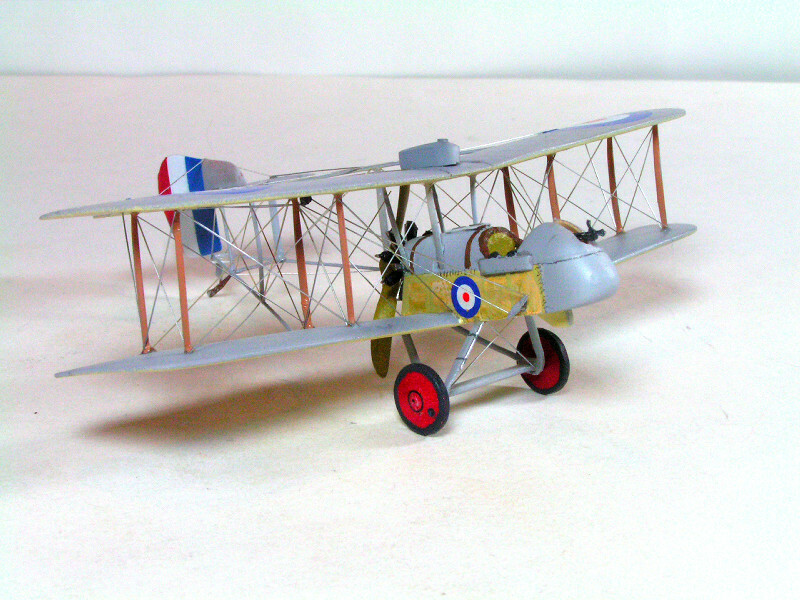 The lower wing has been attached. Now it's on to the tail. Then I can begin thinking about the engine. Nice to see this continuing. Great work and greater patience, Cole. 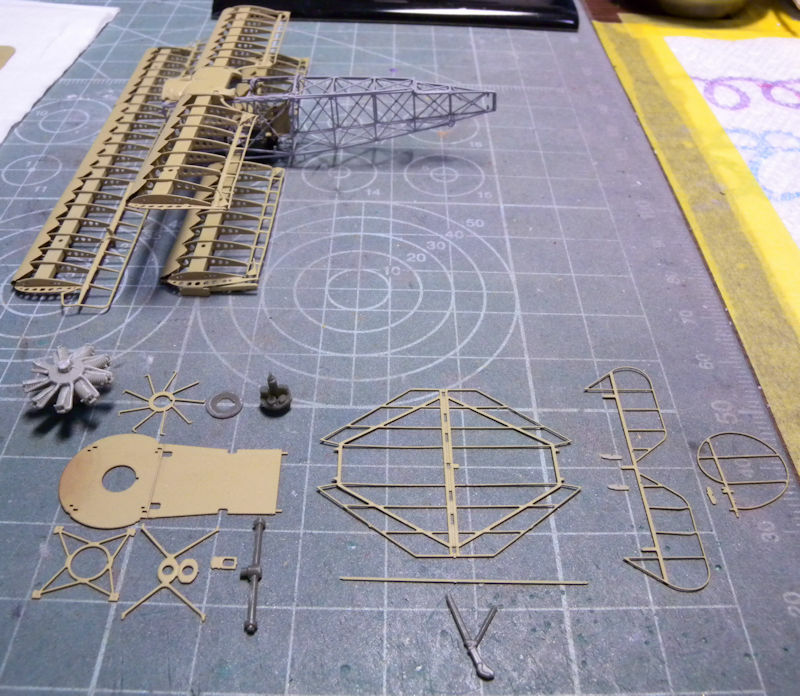 The tail and engine assemblies are next in line. Eduard went to a good deal of trouble on the wheel rims. The resin forming tools produce a concave/convex spoked rim. 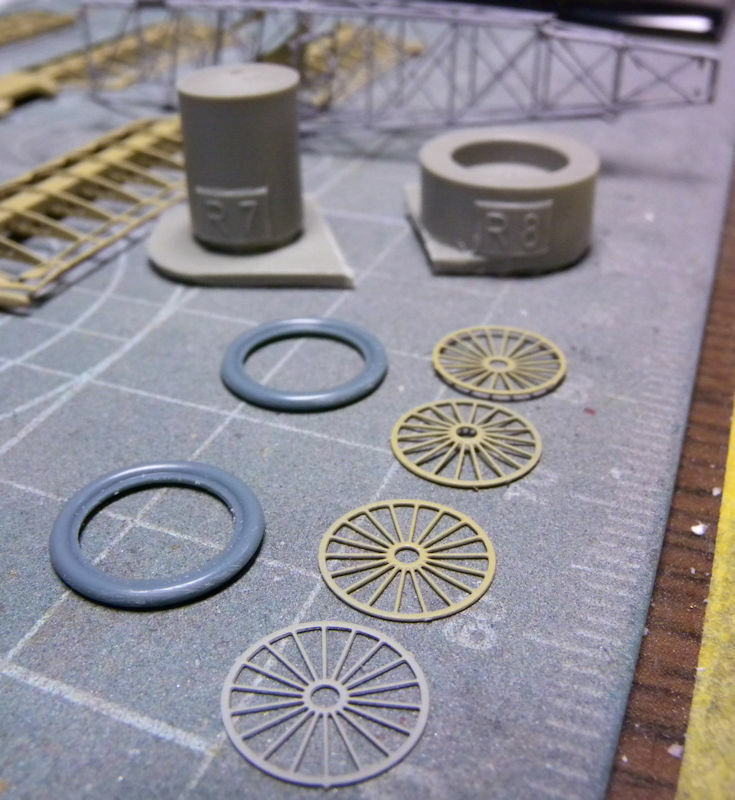 It will likely be unnoticeable on the finished model. Tool does a great job on those wheels. Often when I try to dish those wheels, it'll put a wiggle or a kink in the outer ring. Nice job. 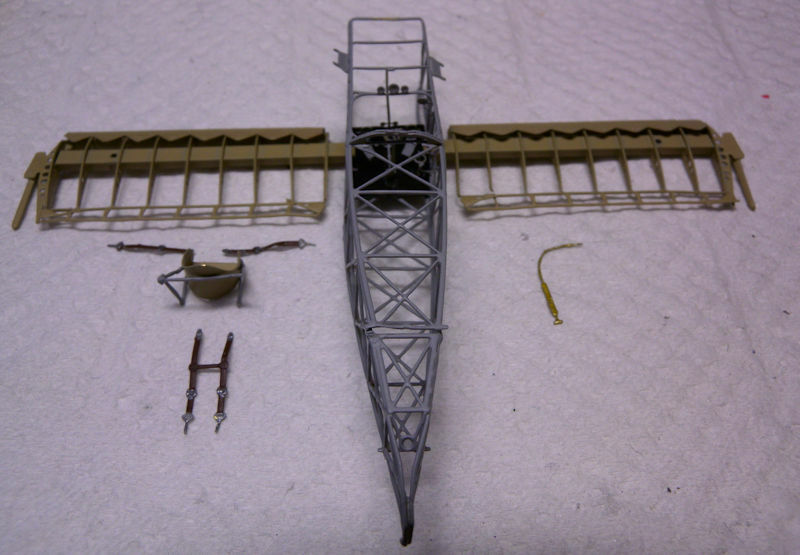 The tail, rudder, and rear landing gear is now in place. Also, the engine assembly is now ready. First I need to attach the throttle to the port side. Then I can figure out how to install the power plant. 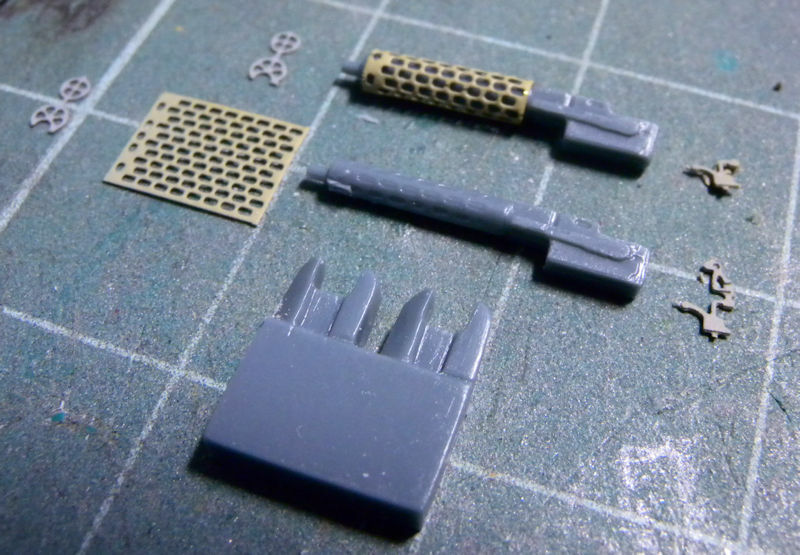 Throttle detail in 1/72nd? That's pretty cool! Hello Mike. It is, but will be covered up by the body skin later. Now, I'm working on the weapons system. 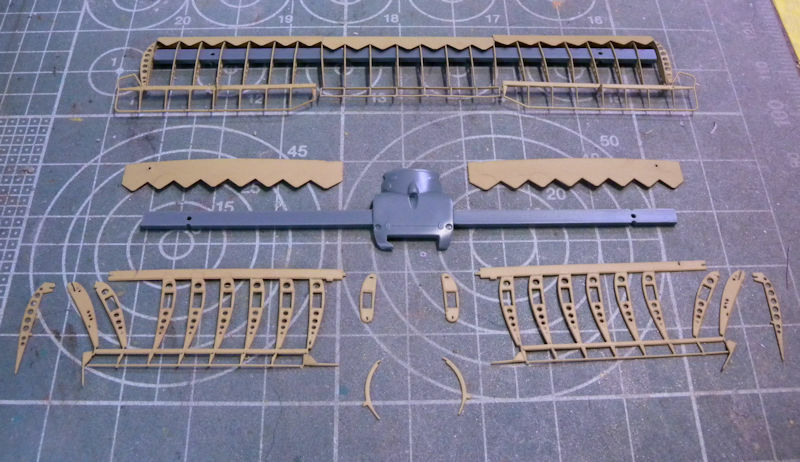 The kit is slowly coming together, but I continue having problems with parts coming apart. 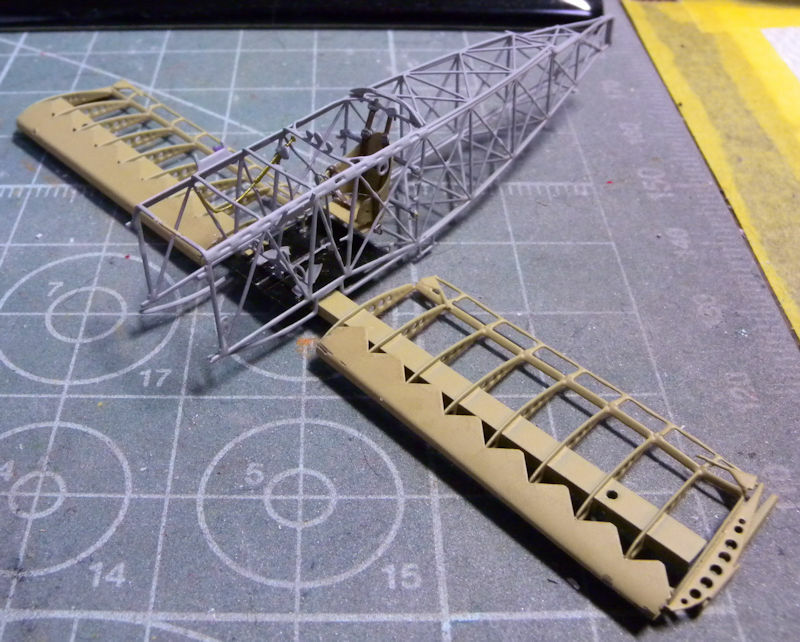 A test fitting of the wings and upper fuselage. Amazing seeing an entire plane built of PE parts, especially in micro scale!